I was painting these for a gallery and thought I’d do a quick sketch first to sort out my yellows. It seems as though summer is here (not sure what happened to spring) so it’s, I hope, a taste of things to come bringing thoughts of eating seafood in the balmy sunshine by the sea somewhere. We had a fishy supper following the completion of said painting. I was a little nervous as the mussels had been in the studio all day but I managed not to kill anyone. I hd a lovely morning at Coton Manor yesterday giving a demo. It was, of course, miserable and wet so we had to be indoors and resort to a jug full of magnolia as so few blooms are appearing in this gloom. Anyway, it was great fun and I met lots of lovely new people. I thought I’d take this opportunity to remind you that I have workshops coming up in the summer at Yardley Arts Centre. 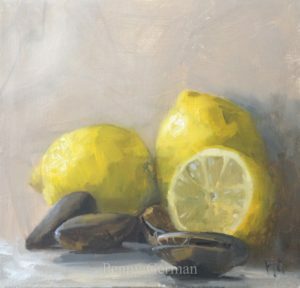 Still life on 23rd July and flower painting on 24th, all levels welcome so do email me if you’re interested. I also have just a couple of places left on the painting trip to France – again all levels welcome. Here’s one I made earlier plus a sneaky peak at the magnolia from yesterday which still needs a bit of tweaking. I had great fun at the studios of BBc Radio Northampton on Sunday morning. It’s all quite fascinating in there and I was able to chunter on about my work and exhibition. I’m going to be working on a few big ones this week so oil sketches may be sporadic. Here’s one to be going on with. Figs yet again! I think it may be here!! Spring, that is. Definitely warmer so that’s a good thing right? There’s only one week left to see my exhibition at 78 Derngate, Northampton with paintings of the gardens and its produce. Speaking of which, I’ll be on Radio Northampton on Sunday morning around 10.35 speaking to John Griff about the exhibition, my painting journey and all sorts. Maybe even mention the theft!! Two paintings were taken off the wall and snuck past the desk. I know! Outrageous. Luckily all my facebook friends and the police are on it so I may get them back, you never know. Not quite Ocean’s Eleven but a big loss to me all the same. I do hope you’ll pop in and see the exhibition anyway. Also, I’m doing a demo at Coton Manor next Tuesday. If you’d like to come and watch, go to their website and book yourself on via their garden school. Fab lunch included and I can recommend their cakes…….sadly.